Although I’ve hiked at Eugenia Falls Conservation Area several times, researching the location for this post yielded some new information for me. I learned that the impressive waterfall was the site of an early “Fools Gold” rush when it was first discovered in 1852 (Grey Sauble Conservation, 2014). Later, the site became dotted with mills and a private electric plant; in 1905, it was home to the second hydroelectric plant in Ontario (Conservation Ontario, 2014; Grey Sauble Conservation, 2014). 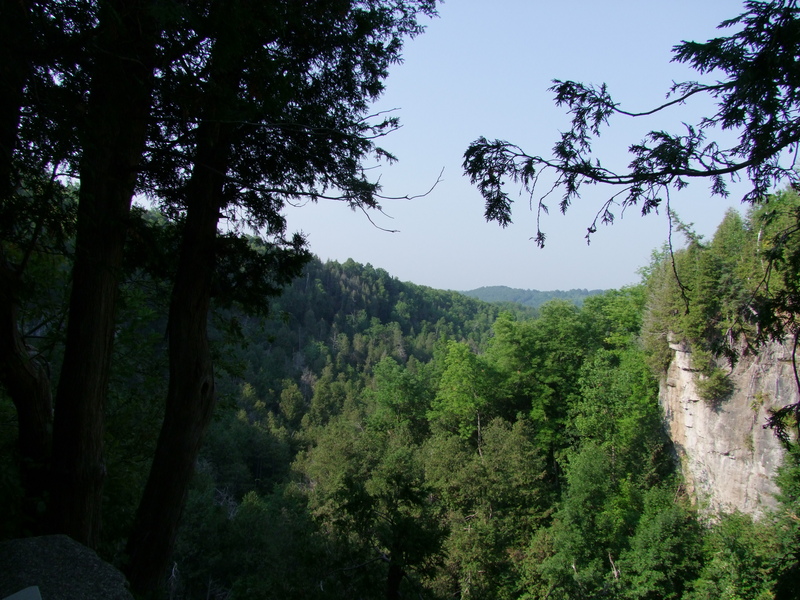 The waterfall is 30 metres in height and the conservation area itself encompasses about 23 hectares of Niagara Escarpment, river valley, and upland forests (Grey Sauble Conservation, 2014). 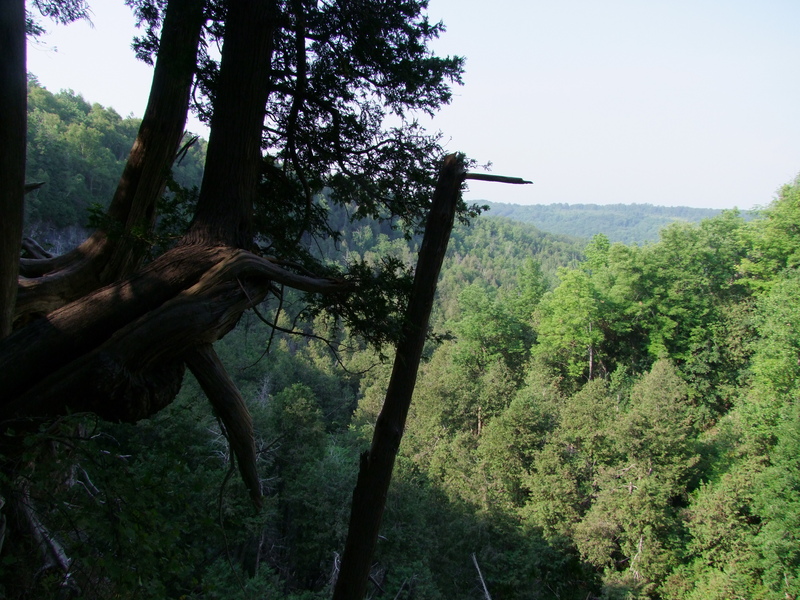 There are many waterfalls in Owen Sound, but Eugenia Falls is thought to be one of the more impressive (Great Lakes Waterfalls and Beyond, 2009). My visits there have made me feel like I’m in another country, if not another world – the vistas overlooking the Beaver Valley are awe-inspiring and the mossy patches of trail look like a habit for fairies. 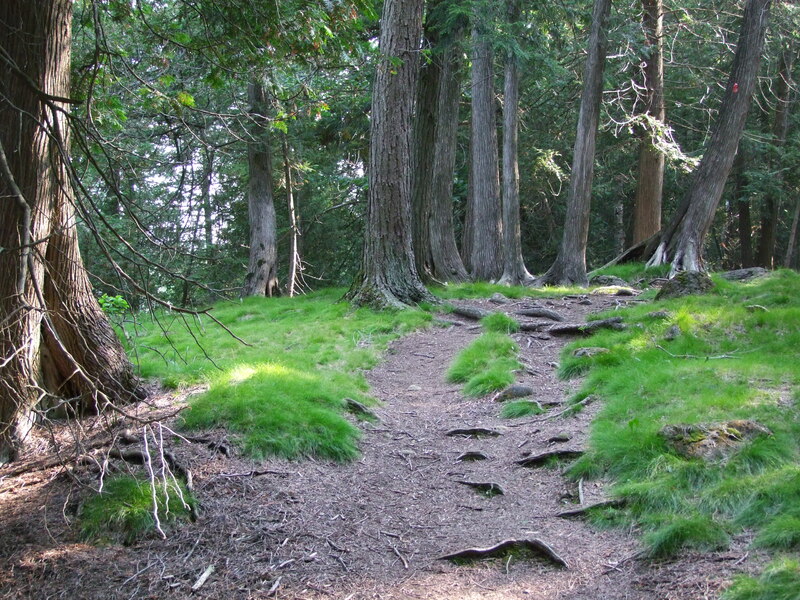 The Bruce Trail also runs through the conservation area. Apparently the waterfall is named after Princess Eugenie, wife of Napoleon III, based on the recommendation of ex-soldiers from the Crimean War who were surveying the area (previously called Artemesia Township) (Grey Sauble Conservation, 2014). This little bit of trivia will only enhance the beauty of the place next time I visit. I hope that you’ll enjoy your visit there, too! 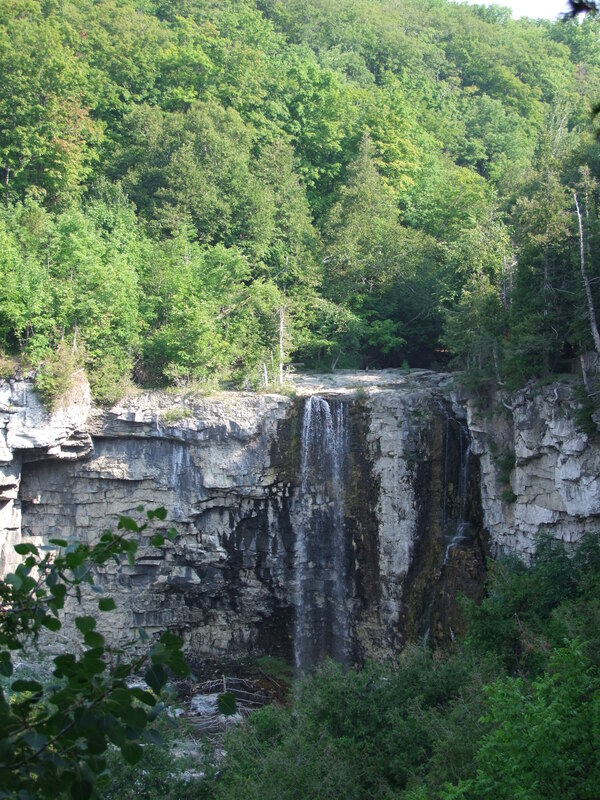 Eugenia Falls is in the town of Eugenia, in Ontario’s Grey County, on Grey County Road 13, just north of Hwy 4 (Great Lakes Waterfalls and Beyond, 2009). A cedar tree clings to a rocky outcropping. Mossy patches make a good place for magical creatures – and earthly wildlife! The view overlooking the Beaver Valley. Our grade 12 class in Flesherton District High School wrote and delivered a play entitled: The Great Eugenia Gold Rush.